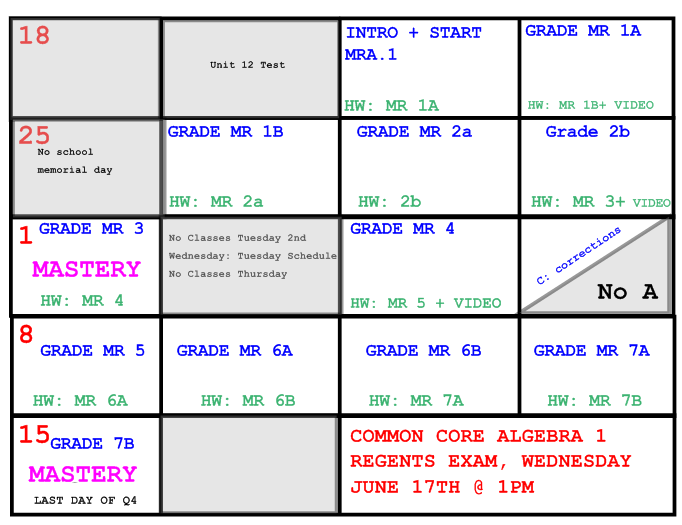 All Algebra students will be taking the Common Core Algebra 1 Regents Exam on Wednesday June 17th at 1pm. All students must earn a 65 on the exam to pass, which is required to graduate from high school and move on to geometry next year. All students must also earn at least 65% of the mastery points throughout the year in order to pass the course! IF YOU ARE ABSENT, EMAIL MS P ASAP TO GET A PDF COPY OF THAT DAY’S MOCK REGENTS SO YOU DO NOT FALL BEHIND! Check the most recent Mastery Tracker to see what topics you are missing mastery on. Remember, all students must earn at least 65% of the mastery points throughout the year to pass the course.